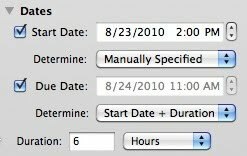 Here's another tasty feature in Curio 7: Curio's start and due date controls now let you specify a starting or ending time value for your tasks. And you can now specify a task duration in hours or minutes as well. Hooray! Sure, we could stop there but what about Curio's automatic date rollups? You know, where Curio can automatically determine start and due dates of items in a list or mind map based on children or predecessor dates and durations? Well, we've updated those routines to work beautifully with times and hour and minute values. Change a task's start/due date or duration and Curio instantly flows the changes to all the dependent figures automatically. And there's more! Curio 7 even adds support for working days and working times! If a 6-hour task was set to begin at Friday at 2:00 PM then it will end at 11:00 AM on Monday since the working times and days will be considered. Brilliant! By the way, in Curio 7 you can now change date and time values directly through the calendar control. If you want to see the handy popup calendar introduced in previous versions of Curio, simply double-click or Option-click the control to make it appear.